Right now I am in a state of shock at my culture shock. I’ve traveled and lived in other countries before, but this recent move to Al Ain, the green oasis of the UAE, has jolted me to the core. As most definitions of culture shock will attest, everything I know, believe, think, expect is being challenged. I am WAY OUT of my comfort zone. The thing about culture shock is that it’s a cocktail mixed with a bunch of other things. It stirs up emotions you didn’t think you had, fears that were previously unknown and prejudices you thought you were too open-minded to have. Yet they’re all there and they come up when you least expect them to and they push you to overcome them. Everyday. When you’re uncomfortable, you seek comfort wherever you can find it. It may be in a stranger’s smile or a song you hear. It may be a Starbucks you spotted or a re-run of Modern Family. It could just be the sunrise and the sense of possibility of a new day. That’s what it usually is for me. That and breakfast. 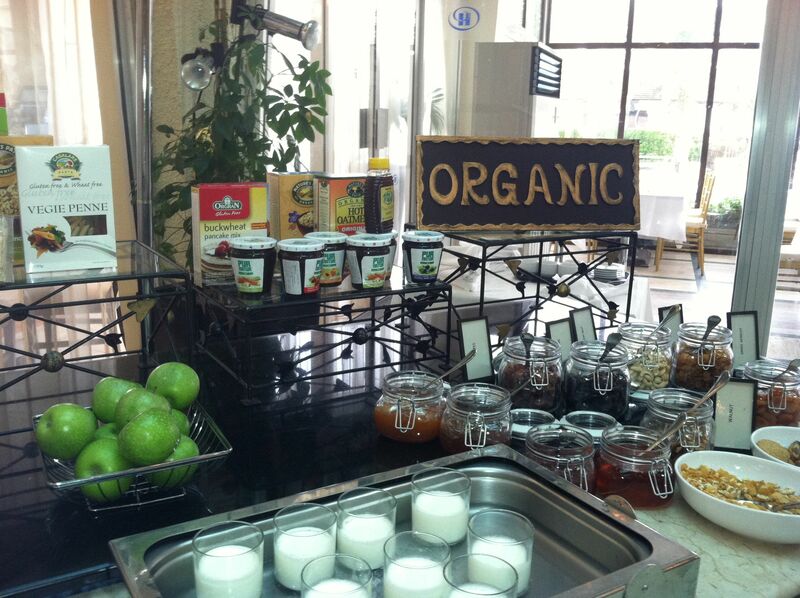 On our 3rd morning at the Hilton, Claire and I went down for breakfast and were greeted by the organic section of the buffet! Organic! Little surprises like these go a long way. Now that we’re “home” in our apartment, it’s a cup of tea with 2 eggs over easy over rice and sauteed spinach (at home, in the USA, it would be kale). In the quiet morning, with a delicious breakfast, I can gather myself and prepare to start fresh, again. It’s what’s required when you’re in the midst of culture shock because all things, large and small, are different. And, you notice them all! It’s also a time of slowness and when I can really watch Claire. It has been incredibly helpful to be with a child. Claire notices things are different (she hasn’t seen many women wearing abayas or men in dishdashes before) but she doesn’t judge anything as good or bad. She notices and she looks (sometimes stares in a way that only kids can get away with) but then quickly returns to whatever is occupying her attention at the moment. When she hears the prayer calls, she simply does her sign language for “music”. Music! That’s exactly what it is, that’s all it is. When she hears our cab driver speaking in Urdu, she laughs. And he usually laughs back. Little by little the differences are overcome by the similarities. It seems impossible now because as soon as you walk out the door everything is hard, but it happens. I know it does because it’s happened before. It just takes time, patience, some laughter and deep breaths and lots of the tea you’ll find below! Then, allow yourself to be surprised and you will be. A few days ago we went to one of the malls, (much nicer and with so many of the same stores as back home), and I spotted a woman covered head to toe in her black abaya and hijab (head scarf), but with her face visible to all. She was also wearing TOMS, just like I was. As they say in Vietnam, “same, same but different”. Indeed we are. 1/2 oz. each of dried chamomile flowers, dried lemon balm, dried catnip leaves and dried lavender flowers. Combine all the herbs and seal in a mason jar. Place 1 T of the mixture in a glass jar and cover with 1 C boiling water. Steep for 15 minutes and ENJOY! *This tea has helped me plenty. It’s from Aviva Romm‘s book, Naturally Health Babies and Children. She calls it “teething tea” which we’ve used several times and has done wonders for as well. It’s soothing, comforting and positively dreamy. I re-named it Miracle Tea because it is miraculously calming! Thank you, Aviva! What an amazing introduction to your life in UAE! I love to view the world through Claire Berlin, what a different take! Things are easier, nicer, better! I wish you, Brad and CB an abundance of joy as you make your way and make UAE a better place for all! It is refreshing to see the world through her eyes! Thank you very much!